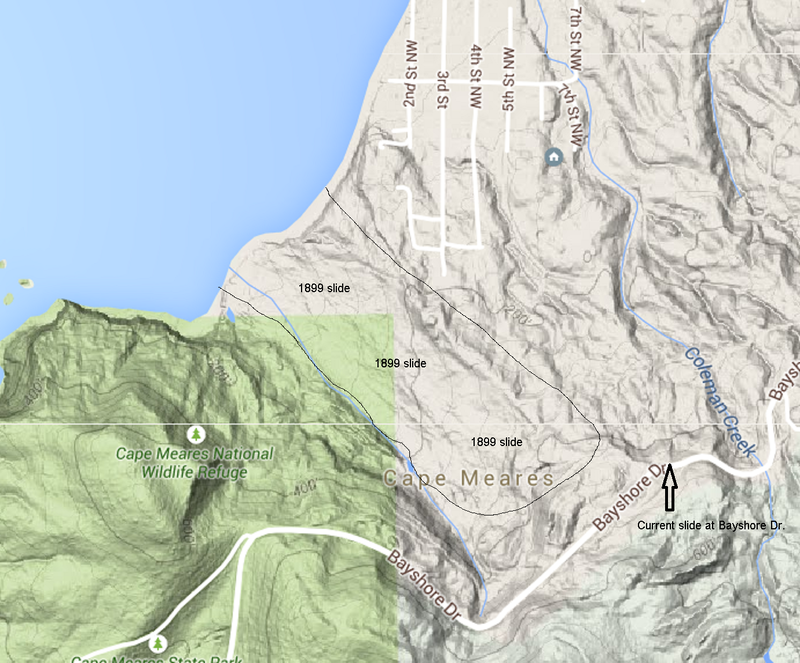 The closure of one mile of the Cape Meares Loop Road in 2013, between the communities of Cape Meares and Oceanside, is caused by a landscape that just wants to keep moving. 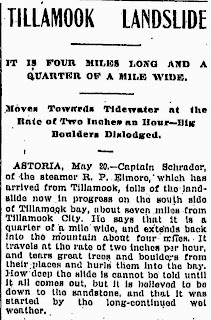 The sliding goes back to at least 1899, based on information discovered by a Tillamook County engineering consultant and forwarded to me by Cape Meares resident Mike Neal. In "A Phenomenal Land Slide, Paper No. 984" in Volume 53 (1904) of the Transactions of the American Society of Civil Engineers, D.D. Clarke describes venturing "partly by rail and boat, but chiefly by stage or mudwagon, crossing the Coast Range, and occupying 36 hours or more," to spend three and half days measuring and sketching the slide. 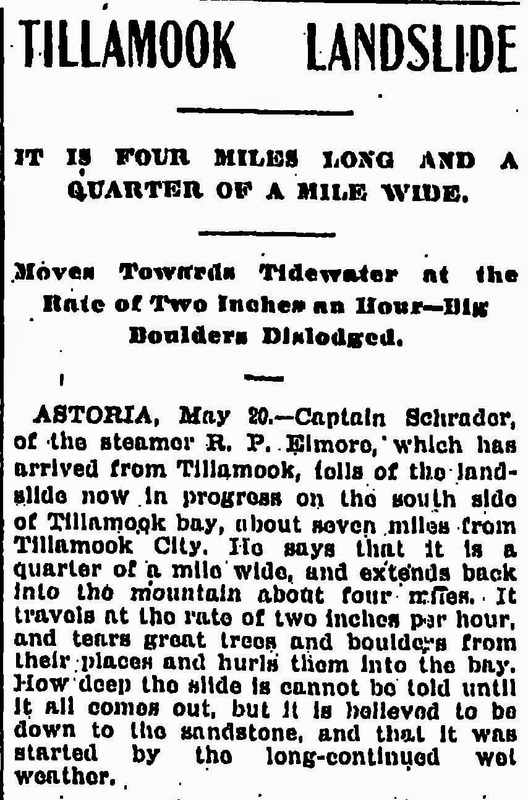 He'd been inspired to do so by a May 21, 1899 Sunday Oregonian article describing a slide that was 1/4 mile wide, four miles long, traveling two inches per hour, that "tears great trees and boulders from their places and hurls them into the bay." Clarke eventually estimated that 30 acres had slid 400 feet from May 10 to June 13, starting up at the 300 foot level, 1/2 mile in total length, and averaging 500' in width. Not quite as dramatic as the newspaper report, but still impressive. He reported that the ocean had already begun eating away at the end of the slide. Mike Neal says that what still juts out a bit in that location is very hard clay. Zoom in on the Google map and you'll see Neal's best estimate of the 1899 slide boundaries. It's very close to what's still sliding today. These landslides are just one way in which Cape Meares has been falling into the ocean millenia. The cliffs also crumble. Mike Watkins pointed out a cave out near the edge of Cape Meares that had collapsed since his childhood. This kind of debri formed Bayocean Spit in the beginning and continues to contribute to it today. 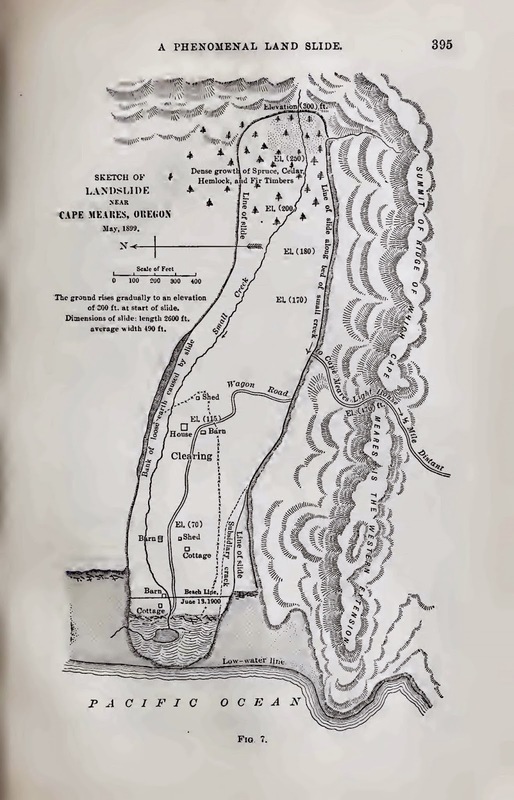 Clarke's sketch provides some early historical information as well. The wagon road shown was built to haul materials for construction of the lighthouse from 1888 to 1890 (Cape Meares And It's Sentinel, 44). It wound its way down to the beach, between the two streams, at which point travel would proceed on wet sand during low tide - a good example of what's discussed in The Oregon Beach Bill and Bayocean. The break in the road must have been repaired because the children of lighthouse tenders and their teacher road it down to a school that operated even before Bayocean was built (ibid, 68-70). 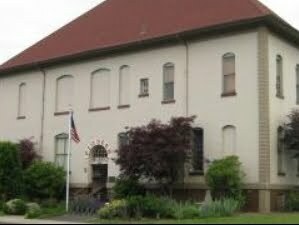 Tenders originally used the road to get to Hauxhurst landing on Tillamook Bay, from which they'd row over to Tillamook to get supplies, but in 1893 Hodgdon Road (now the Netarts Road) had been extended to the lighthouse (ibid, 44,66). The buildings depicted would have belonged to Henry M. Sampson, who was granted patent #1339 in 1882. 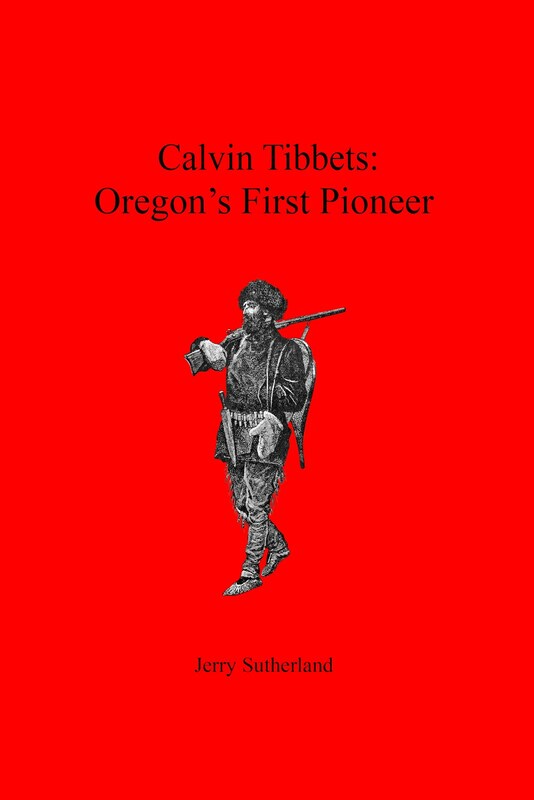 On page 234 of Tillamook: Land of Many Waters, Ada M. Orcutt said one correspondent described the slide "being on the Hauxhurst beach in a valley of Foley Creek." Another called it the "Barnegat Slide." To find more stories about the geological history of Bayocean, or any other category, see the Index.